A mix of various genres. The game combines features of strategy and role-playing games. It takes place in a post-apocalyptic world mixed with oriental themes. The player can control a single character or up to fifty characters simultaneously. 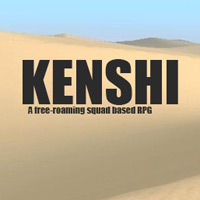 Kenshi is a sandbox combination of a real-time strategy game and a role-play. It is the debut title of the independent British studio Lo-Fi Games. The game was released on PC. Kenshi for PC takes place in a reality that combines post-apocalyptic themes and oriental influences. The game features only a singleplayer mode. The player can control a single character or up to fifty characters simultaneously. The characters don’t have to remain close to each other. If the player wants to, he or she can send them to various distant locations. The game world is gigantic and it features 400 square kilometers of areas. The player can move through long distances by using a quick travel system similar to one in Fallout – the progress of the party can be observed on a map. The virtual reality of the game is fully dynamic. The non-playable characters and factions that inhabit the land are living their own lives, even if the player has no contact with them. The battles are fought in real time and are similar to beat ‘em up games. The characters feature unique fighting styles and special attacks. Statistics of characters can determine the outcome of battles as well. The game features RTS-like unit management system. Buying and upgrading buildings is important as well – this enables the player to, for example, fortify constructions. The developers focused on realism. The characters controlled by the player aren’t some chosen ones. Instead, they start at the same level as other inhabitants of the world and they can be easily killed or wounded. The player must gain each achievement on his or hers own. At the same time, the game doesn’t limit the freedom of the player in any way. One can be evil or good, conduct business or steal from other characters. It is possible to join an army or become a hermit who lives alone on a desert. The game even enables the player to build cities or destroy other ones. A realistic health system makes the game more interesting. A character, whose leg is wounded will hobble and slow down the whole group. Losing an eye will worsen the sight and a wounded arm will make it harder to use a sword. If a character bleeds, they can pass out and the smell of blood will lure other predators. Bad physical condition, bad weather, heavy equipment or lack of water will increase fatigue, thus reducing combat abilities. Luckily, it is possible to replace a lost limb with a cybernetic part. However, this won’t be cheap. Game score 8.06 / 10 calculated out of 66 players' votes. Expectations before the premiere: 8.1 / 10 calculated out of 59 players' votes.